Trim this darling white silk hat with handmade sunflowers! We will show you how to make the hat and the flowers in this fun tutorial! 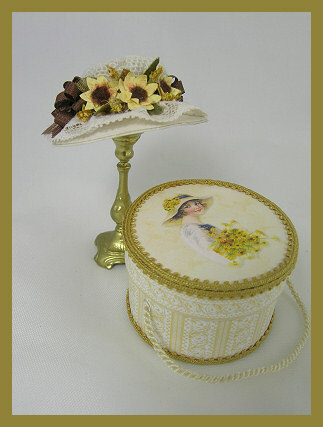 Matching hatbox also included. Download is in PDF format. It contains complete instructions with dozens of photos, full size pattern pieces for the hat, and hatbox, and full color artwork for the hatbox. Please allow up to 24 hours for us to process your order. You will receive an email notification when your download is ready. It will be located in your "My Account" area by locating the current order.